→How To Hit The Baseball Farther? 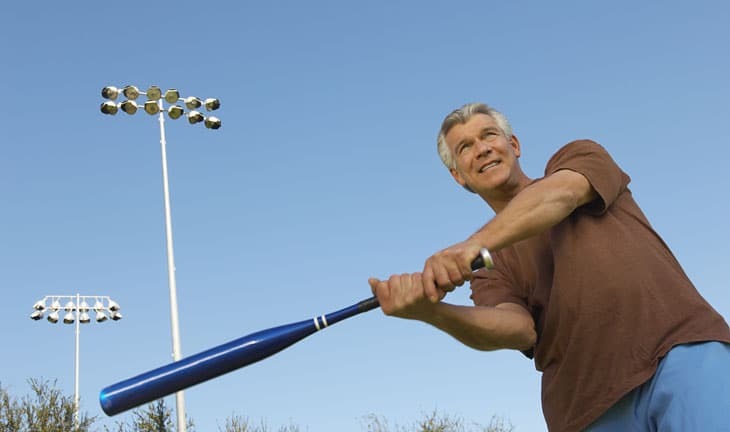 ​​“How to hit the baseball farther for a home run?” is one of the most important questions to be answered for a rookie player. ​It is quite important for the baseball hitter or batter to realize that how well they can hit so that they not only have the time to run from base to base but also they can hit at distance where it is considered to a home run. The grip of the bat, swing, strength, angle and the pitch are some of the important factors that make it possible for the hitter to hit hard and get the maximum distance. ​In this section, before moving to the steps that must be followed, we will inculcate some of the tips and the tricks that must be followed by the player. They not only need to focus their strength but the right timing and the right body movement, is necessary for the hitter. Yes, it is not only about the strength of our upper bodies such as wrist and the shoulder, but the movement of your lower body also plays a crucial role. While you are gripping your bat, it is the weight of your body that lands on the ball of your foot and hence you make sure to find the right grip and right angle. Hence the posture and the movement free lower body make a huge impact while you are batting. ​2. Apply You Strength But Only When You Are About To Hit. Before clearing this point, let’s remind you one thing that “you must not hold the bat too tightly just while you are making the grip. It will cause fatigue, and hence you will lose the momentum while you hit.” So apply all your body strength when you are about to hit. It will not only help you to have stronger hit, but you will also be free from that extra fatigue. ​3. Find The Right Grip And Swing Angel. Indeed, gripping your bat from the right position and the swing angle plays a crucial role in hitting the ball. While you are holding, make sure to make a right grip so that you can channelize all your strength while you hit. Moreover, choosing the right angle will help the ball to hit the right place of your bat and finally you may have high chances to hit a home run. 4. Make Sure To Strength Then Your Body. ​A weak body, with weak muscles and poor strength, will be of no use f you are a good hitter. Make sure to work out, to have a good diet so that you can have the strong muscles while you play. ​5. The Posture Of Your Body While You Are About To Hit, Matters A Lot. ​This is not over yet. While you are standing to make a hit, stand right. Choosing the proper while you stand is quite remarkable. Moreover, you must stand alert and don’t make any movement once you have gripped your bat and chosen the right angle to hit. ​6. Finally, Choose The Proper Bat And Proper Place To Hit. Indeed choosing the right bat is quite important as it will not only give a proper channel to your strength but the strength of your bat will help you to have a good hit. The length of the bat, weight of the bat and your hitting style helps you in choosing the right bat. The impact of the ball on the bat is also crucial as it might be the wrong position where the ball has hit, and you may lose due to that. Now, in brief, we will be inculcating some of the necessary steps that must be followed while you are aiming to hit the home run. ​1. The first and the foremost thing is to practice hard and try to understand all the important aspects that can help you to hit farther. These aspects are the points stated in the section above like right posture, right grip, right angle and the right place on the bat for the impact.